Real Deluxe Samurai Katana Sword. 41" overall in length with 28" blade. 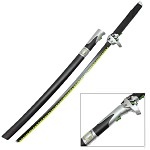 Full tang Katana for extreme strength and durability. 440 Stainless steel blade. Handmade Full Tang Highlander Connor MacLeod Sword. 43" Overall. 12.5" Handle. 27" Blade. Hand forge high carbon steel blade with blood groove. Apocalypse High Carbon Steel Full Tang Katana Sword. FREE sword stand and black sword bag is included. 40.5 Inch Overall in length. Handmade Full Tang Takeda Shingen Japanese Traditional Katana. Comes in a decorative sword box. Handmade Takeda Shingen Traditional Japanese Samurai Katana With Decorative Sword Box. Overall Length With Scabbard: 41"
Hand Forged Carbon Steel Samurai Sword With Musashi Tsuba. Free sword bag included. Overall length with scabbard: 40.75"
Functional Carbon Steel Miyamoto Handmade Samurai Katana Sword. 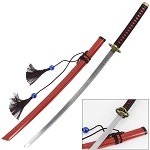 Overall length with scabbard: 40.5"
1045 Steel Samurai Sword Katana Sharp Edge Black Glossy Dragon Scabbard. Overall Length with scabbard: 40.5"
Crane Katana Handmade Samurai Sword Carbon Steel Full Tang. Overall Length With Scabbard: 40.5"
Black Open Mouth Dragon Highland Connor MacLeod Fantasy Katana Sword Replica. 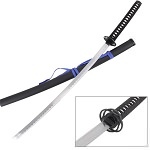 Overall Length With Scabbard: 43"
Anime Fantasy Samurai Sword Blue Warrior Katana Holy Spiritus. Samurai swords are the way of the warriors as explained by the most basic ethic code of the Samurais - Bushido. The Samurais have their name in the list of the most skillful and top-notch warriors of history. Also known as The Bushi, they were the nobles of the feudal Japan. These high ranking people lived in the Edo Period that ranged between 1603-1867. Being the best warriors, the Samurais constructed and made use of lots of weapons i.e. spears, bows and arrows but their primary and main weapon was the sword. Yes, Samurai swords as their owners, speak of elegance and grace. The Samurais were people of class and practiced self-discipline, loyalty and sincerity. They lived by their rules and codes. Hey, are you getting inspired by these nobel warriors? So, you should definitely get yourself their most prized possession - The Samurai sword. But, from where can you have one? Don’t worry, Wholesale Blades got your covered here as we stock the most amazing variety of the best Samurai swords. 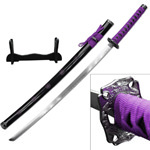 Wholesale Blades offers a wide selection of the best Samurai Katana swords. Our real Samurai swords are for the true warriors and cannot be wielded by anyone less than that. These swords of the Bushi are ranked amongst the best swords of history. Our Samurai swords depict the true essence of the real Samurai swords of so many years ago. 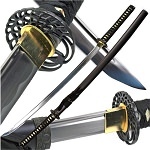 These Samurai Katana swords are constructed of the best materials and will help you excel at those combat skills and swordplay you also wanted. 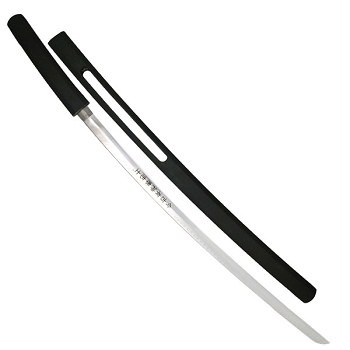 Our real Samurai swords are very strong, feature curved blades and rounded guards and the finest blades. The blades slice anything that comes their way in one go and give you the feel of a brave and vigilant warrior. And when it comes to the design and structure of our Samurai swords, we have the ones that are the exact replicas of the real Samurai swords. Wielding one and practicing the beautiful art of swordplay with it, will make you feel like a true, legendary Samurai warrior. So, you want that for yourself? The elegant Samurai sword and the glory that comes with it? 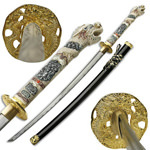 If yes, then have a look at our immense collection of the most beautiful Samurai swords for sale and make your purchase now at the lowest possible rates. Wholesale Blades provides the best wholesale and dropshipping services to its customers. 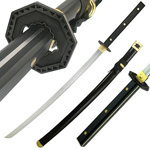 Our Samurai swords come with exceptional features and top quality construction. And we offer them at a very superb wholesale offer to our customers to help them succeed in their business and make it grow as well. 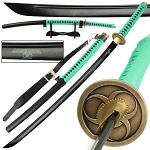 We only a require a minimum order of $25 on our wholesale Samurai swords but offer a FLAT 20% off on the sword if you purchase six or more items of the same Samurai sword from us. We also offer 100% Free Dropshipping services to our customers who are in dropshipping business. Yes, it is true! Now you can start business with us without any membership fee or drop shipping fee. 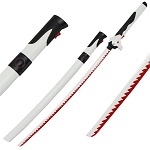 Apart from these mind blowing offers, we also provide the best Samurai swords at the most affordable rates. So, make your purchase from us today to avail the best offers ever and the fastest shipping of one business day as well! I get all my knives at wholesale. I now buy from wholesaleblades, because they are fast cheap and understanding. They know what sells. I make a decent profit from little investment and now that I sell on ebay, I don't have to work for someone else anymore. I highly recommend them. I love it my customers love it and it just works... what more could you want? Copyright Wholesale Blades. All Rights Reserved.